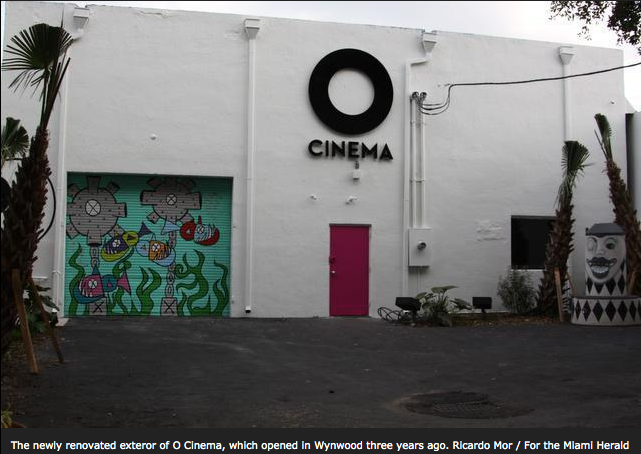 Three years ago, an independent theater called O Cinema opened in the Wynwood Arts District with the hope of bringing independent and foreign films to Miami’s urban core. This year, the theater celebrates its surprising success with new programming and upgrades that will give it a greater sense of permanence in the community. Co-founders Kareem Tabsch and Vivian Marthell had the idea to create what is now O Cinema back in 2008. Thanks in large part to a $400,0000 grant by the Knight Foundation through the Knight Arts Challenge program, they were able to execute their ambitious plans to build an independent theater in Wynwood, but the project was not without difficulties. While O Cinema flourishes today, there was a time when the project was almost dead on arrival. The timing of the founders couldn’t have been worse, as they were attempting to raise the money necessary to match the grant dollars for the theater in what would turn out to be the worst recession since the Great Depression. In addition, their struggle to find a building to lease proved so difficult that the Knight Foundation was having second thoughts about funding their project. “I had a number of discussions with them saying if you can’t deliver on the idea of the project, we might have to cancel the grant and take the money back. At the very last minute, they came up with the lease in a great location on 29th Street and, of course, the rest is history, as they have turned out to be one of the most important community engagement arts organizations in Wynwood,” said Dennis Scholl, vice president of arts for the Knight Foundation. The theater, which recently celebrated its third birthday, has had a passionate following among local cinephiles looking for their film fix. In addition to their regular film programming, they often host live Q&As with guest speakers, interactive film events, midnight screenings of cult films and even wine and food events. The theater has proved successful enough that they were able to open a second location in Miami Shores in collaboration with Miami Theater Center, and they are currently in the works to open a third location in Miami-Dade County. While O Cinema’s Wynwood home has been very popular, it has been a work in progress since it opened. The space, which has served as artist studio and a wood shop in the past, was essentially a large warehouse retrofitted into a theater, which isn’t an ideal place to show films. Because of the theater’s humble origins, much of the theater’s technology was lower quality than one might find in a traditional multiplex. But the theater has finally addressed those issues with several new upgrades to the facilities. Among the technology upgrades is an industry-standard 2K digital projection system, which is three to four times the resolution of the previous projector, which results in cleaner, crisper picture quality. Organizers also purchased a new projection screen that is twice the size of the previous one, a major improvement from the former modestly-sized screen. In addition, the theater upgraded the sound system from stereo to surround sound, with speakers and sound-dampening panels along the walls to greatly improve the sound experience. Finally, the permanent seating was expanded from 50 to 114 seats, which also are more closely aligned to the screen. Much of the upgrades have been possible because of a second $45,000 grant from Knight Arts Challenge. It is extremely rare for an organization to receive a Knight Arts Challenge twice, but Scholl says that the foundation looks for organizations and ideas that demonstrate artistic excellence and community engagement. “O Cinema has delivered on both of those promises wonderfully,” Scholl said. The funds will help also pay for a second screen in a space that is now used for storage. The second screening room will be smaller, with seating for only 30 to 35 people, but the hope is that it will act as a theater for lesser-known films that might not otherwise be shown at the theater. The theater will be soon starting a crowd-funding campaign to help raise the necessary money to match the Knight Foundation dollars with the hopes to launch in the summer. The renovations give the theater a new found sense of legitimacy and permanence, with its investments furthering their commitment to the community. Kevin Bosch, operations manager and associate programmer of O Cinema, hopes audience will see that their support by attending the theater despite its former shortcomings help made their upgrades possible. “I think they’ll feel that it’s an investment that has paid off. … They’ll feel like because they’ve kept coming, they earned this,” he said. The theater will continue to show its regular slate of offbeat and eccentric films while also introducing new programs, such as art exhibitions by Miami Beach’s ArtCenter/South Florida that will take place in the Wynwood location’s lobby. And while the new upgrades and renovations give O Cinema a whole new feel, Tabsch hopes that audiences will still recognize the soul of the theater remains the same. ← This Week at O-Cinema! Miam Cafe and Boutique Opening Soon in Wynwood! Curator’s Voice Art Projects in Wynwood!